The death of Peter Winch in 1997 sparked a revived interest in his work with this book arguing his work suffered misrepresentation in both recent literature and in contemporary critiques of his writing. Debates in philosophy and sociology about foundational questions of social ontology and methodology often claim to have adequately incorporated and moved beyond Winch's concerns. Re-establishing a Winchian voice, the authors examine how such contentions involve a failure to understand central themes in Winch's writings and that the issues which occupied him in his Idea of a Social Science and its Relation to Philosophy and later papers remain central to social studies. The volume offers a careful reading of the text in alliance with Wittgensteinian insights and alongside a focus on the nature and results of social thought and inquiry. It draws parallels with other movements in the social studies, notably ethnomethodology, to demonstrate how Winch's central claim is both more significant and more difficult to transcend than sociologists and philosophers have hitherto imagined. 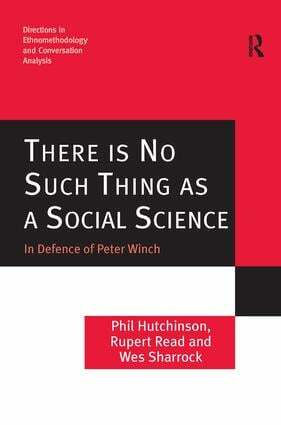 Contents: Preface; Introduction: the legendary Peter Winch and the myth of 'social science'; Beyond pluralism, monism, relativism, realism etc: reassessing Peter Winch; Winch and linguistic idealism; Seeing for themselves: Winch, ethnography, ethnomethodology and social studies; Winch and conservatism: the question of philosophical quietism; Conclusion; Bibliography; Index. Ethnomethodology and Conversation Analysis are cognate approaches to the study of social action that together comprise a major perspective within the contemporary human sciences. Ethnomethodology focuses upon the production of situated and ordered social action of all kinds, whilst Conversation Analysis has a more specific focus on the production and organisation of talk-in-interaction. Of course, given that so much social action is conducted in and through talk, there are substantive as well theoretical continuities between the two approaches. Focusing on social activities as situated human productions, these approaches seek to analyse the intelligibility and accountability of social activities ‘from within’ those activities themselves, using methods that can be analysed and described. Such methods amount to aptitudes, skills, knowledge and competencies that members of society use, rely upon and take for granted in conducting their affairs across the whole range of social life. As a result of the methodological rewards consequent upon their unique analytic approach and attention to the detailed orderliness of social life, Ethnomethodology and Conversation Analysis have ramified across a wide range of human science disciplines throughout the world, including anthropology, social psychology, linguistics, communication studies and social studies of science and technology. This series is dedicated to publishing the latest work in these two fields, including research monographs, edited collections and theoretical treatises. As such, its volumes are essential reading for those concerned with the study of human conduct and aptitudes, the (re)production of social orderliness and the methods and aspirations of the social sciences.